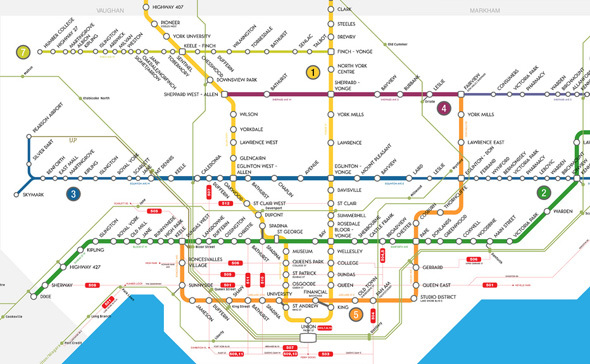 Rob Ford has released his own TTC fantasy map transit plan as the Toronto mayoral campaign enters the final stretch. The vision is what you might describe as a doozy: 32 kilometres of subways at projected cost of $9 billion. Ford calls for the extension of the existing Sheppard Subway to McCowan, the first phase of a Yonge Street Relief Line, the burial of the Eglinton Crosstown, and an 11km line on Finch Avenue West. Where does the money for all these projects come from? That's the giant question mark bobbing above this fantasy map. Aside from snatching some money way from approved LRT lines (Sheppard and Finch), none of these subways have funding in place. Ford's plan calls for a variety of strategies to pay for infrastructure expansion, but is unsurprisingly bereft of specifics. You've got tax increment financing, selling the air rights above subway stations, public-private partnerships, development charges, future assessment growth, and the sale of existing city assets along proposed subway lines. None of these worked for the subway that Ford campaigned so hard on last time. The Bloor-Danforth extension will only be possible with loads of cash from other levels of government and quite possibly a property tax increase. In other words, this plan is actually somewhat conservative. If the exercise is just to dream up what would make an ideal subway system in Toronto with no attention paid to the harsh realities of funding transit expansion, then one thinks it would look a whole lot better than this.